MSN UK has just released an exclusive new clip from Percy Jackson: Sea of Monsters movie. This 1-minute clip already gives us the tone of the movie and a little of what to expect from it. Director Thor Freudenthal has really stepped up, if not exceeded, to making this movie much better than the first one and I can't complain about that. Percy Jackson and the other chosen champions of the prophecy may well have to face the greatest threat and most important quest yet. Not only do their lives depend on the success of finding the Golden Fleece, but the rest of the demigods living in Camp Half-Blood as well. 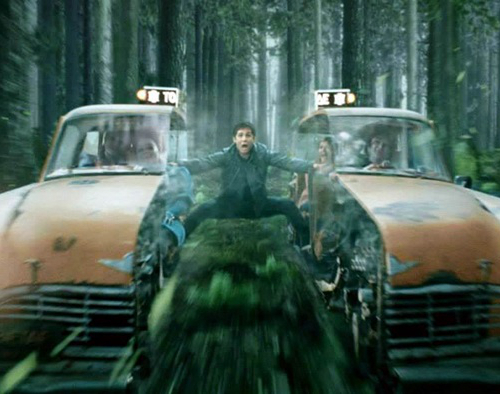 Watch the new Percy Jackson: Sea of Monsters clip below. From MSN: In this exclusive clip from Percy Jackson: Sea Of Monsters, the group take a taxi ride they'll never forget in the chariot of damnation! Watch Percy Jackson: Sea of Monsters movie in theaters on August 7, 2013.